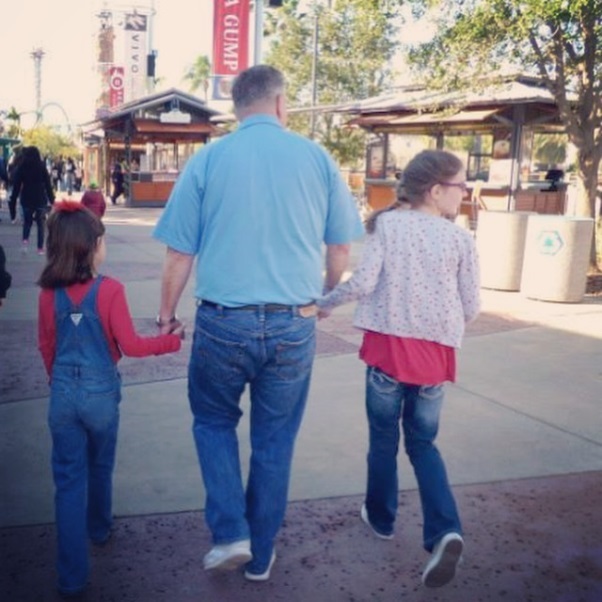 I have a confession… I have a Disneyland Dad. I have a dad who is not called Grandpa by my girls, but Funpa. I have a dad who takes my girls bowling and to Funplex and makes adventure out of everything. I have a dad who introduced my girls to mochas and minions. In every way he fits the definition of a Disneyland Dad. The term Disneyland Dad dates back to an era when parents without custody and without much parenting time spent it entirely in fun and games with their children, while the custodial parent was left with the math homework and laundry. Today it’s different, but we still hear the phrase. We minimize the complexities of parenthood with our tendency to attach seemingly clever labels onto people. But I can tell you that what I have learned from my Disneyland Dad is that I am inspired by his ability to harness and enjoy the youthful energy of my daughters. He has taught me to stop fussing so much about the details of my perfect plan and to just enjoy the moment. He has shown me the value of being patient with my girls and trying to view the world from their perspective. And he is usually right when he suggests that my daughters are more capable than I give them credit for. During divorce, there is a lot of bitterness around sharing parenting time – because we all want all of the time. There is sadness around missing moments with your kids. But I suggest to all parents during this time: show off your inner Disneyland Dad and appreciate when your co-parent is embracing theirs. Dads rumble and tumble around. Dads are good at video games. Dads play hard. But dads love hard too. Enjoy the boundless energy and innocence of your children and appreciate they do not understand the intricacies of adult relationships and the heartbreak you are experiencing. Enjoy the present moments with them, they are now numbered, so stop fretting about that and maximize the time spent. Be patient with them and try to understand the impact of your behavior on them. I have repeatedly seen a trend with divorcing parents and children: if the parents show up as “all-is-well” so too do the children. The reverse also holds true: if the parent shows up distraught, so too do the children. And last, know that they are more capable of this transition than you realize. I thank my Disneyland Dad for teaching me courage as he holds my hand on this roller coaster of life, for playing with me because it brings me present, and for demonstrating commitment as he shows up as my Prince Charming anytime I need him.